Super Sunday, Race Horse Company | Derby Theatre. 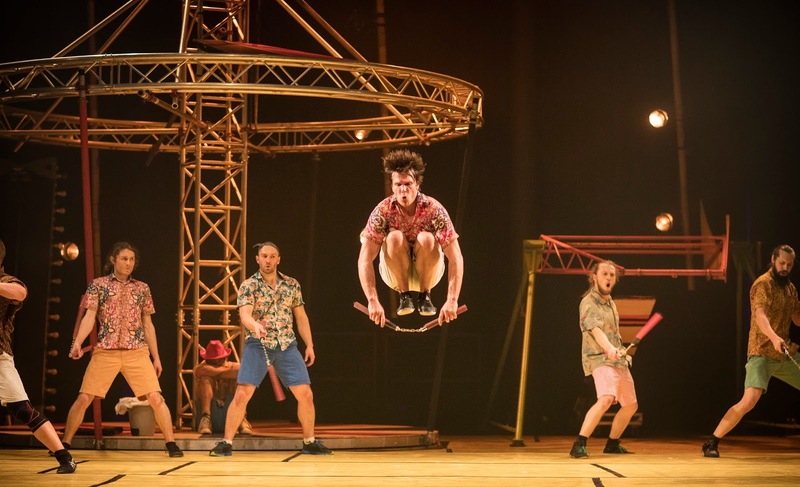 Six male performers, dressed in Hawaiian shirts and shorts present a thrilling, ambitious, fun production in their fusion of dance and circus in Super Sunday. 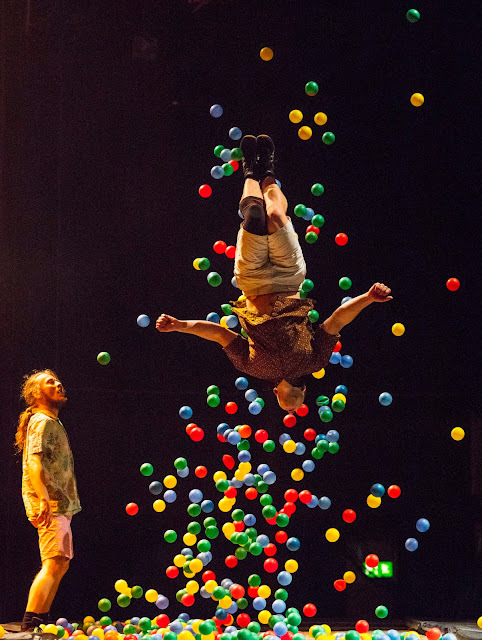 Race Horse Company completely transformed Derby Theatre's stage from a vacant fairground to a place of fun and creativity in a 65 minute piece that pretty much flashes before your eyes. What Super Sunday delivers in their daring tricks they make up with a laid-back humour and carnival atmosphere, often acknowledging the audience in the room. We watch the six performers throw themselves around a spinning carousel but with minus the horses, a 360 degree swing on it's axis candy pink car apparatus and a unlucky giant teddy bear who is thrown into the air. I loved watching how these male performers threw themselves into their tricks, with little time for fear to take control. They're tricks were extremely slick and well executed, sometimes even acknowledging one another in smashing one of the more daring and bold tricks of the evening. I think the less traditional, Lycra outfit acrobats made this performance a very comfortable watch. This was definitely down to their laid-back approach and worked a treat! There was great variety within this piece and high level of intensity and energy thrown in for good measure. The piece will definitely set your mind alight with imagination and wonder over the 65 minutes, let it capture you! I would definitely be up for watching this piece all over again! I was invited along to this performance of Super Sunday by Derby Theatre. All opinions are my own.